Yes, folks, the situation is so bad that there are now studies on it. There are reports of concussions, sprained ankles and broken appendages, not to mention the countless number of people who hurt nothing but their pride by walking into a parked car and never went to an ER (happens all the time, apparently). Darwin Award winners are not far behind. 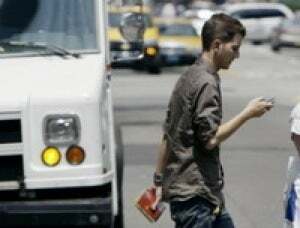 Of course, there's a larger trend here, of which walking while texting is but a small part. It goes by many names: multitasking, information overload, a Gizmodo weekday writer's normal schedule. Whatever you call it, neuroscientists, cognitive researchers and other professionals are now actively studying its impact on our gray matter. So far, it's bad. Basically, talking on a cellphone takes up so much of our attention it's overwhelming ever-important things like, say, our survival instincts. Yes, say researchers, that conversation with your bro about the next Android OS is higher on the pecking order than keeping an eye out for that oncoming train or approaching light pole.